The MSI MEGA mPC 945 system is definitely different from conventional SFF boxes; the front of the system is ultra minimalist, it lacks any real indications that this is a computer. The white tic-tac-toe bezel may appear a little odd at first glace, but the design quickly grew on us. The 3x3 box grid is accompanied by only two buttons, and a well hidden front bezel panel that contains much more... The top row of boxes is actually a flap that folds down to reveal the 5.25" optical drive bay. It is spring loaded, so when you don't need to access the optical drive it closes up automatically. 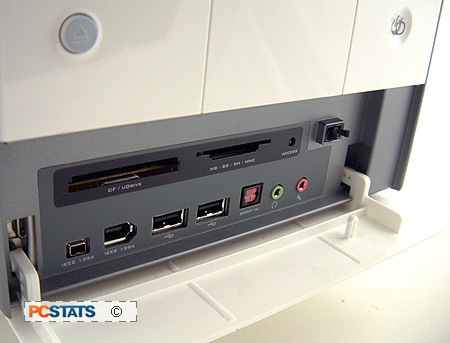 The front of the MSI Mega mPC 945 is a clean white face of simple grid lines. All the front USB, audio and media ports and connectors are hidden behind a front panel that swings down when you need to access them. There are only two buttons on the face of the mPC 945 system, one at left to eject the CD-ROM, and the illuminated power button at right. The very bottom row of boxes is another flap, this one is the kind you push in to open. The flap exposes the 7-in-1 media card reader along with two IEEE 1394 ports, two USB ports, a SPDIF in jack and a headphone/mic jack. The flash memory media reader supports the following formats: CompactFlash, Memory Stick, SmartMedia, SD, MultiMediaCard, MS-pro and CF Microdrives. At least one of these standards is used in every type of digital camera, so this is a great asset to the MSI Mega mPC 945 in our books. The upper flap hides a single 5.25" bay for optical drives. The manufacturer recommends only using optical drives with flat bezels. The space between each of these flaps looks like it should hide away a 3.5" floppy disk drive bay, but it doesn't do anything. The mPC 945 does not have any provisions to support a FDD.... so you had best install a CD/DVD burner or pick up a USB thumb drive if you want to transfer to and from the Mega mPC 945. Alternatively, the system also has its own Wireless 802.11b/g network card, and a wired 10/1000 Gigabit Ethernet jack so large file transfers can be done just as easily over the network. 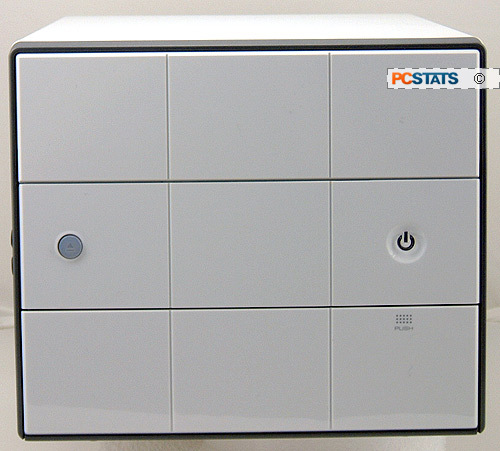 PCSTATS has a great guide to wireless home networking right here if you need help setting that up. At the bottom of the front bezel are a collection of front panel I/O connectors and flash memory ports. On the mPC945 there is a mini-Firewire, IEEE 1394 Firewire, two USB 2.0, SP/DIF optical audio in, headphone and microphone connection. Above these ports are Compact Flash, microdrive, smart media, SD, and Sony Memory stick ports where you can dock a flash memory card. Along the sides of the MSI MEGA mPC 945 are air vents and it's vital that they are not blocked. Socket 775 Intel Pentium 4/D/XE and Celeron processors generate a lot of heat, so the consequence of obstructing this vents is not so good. 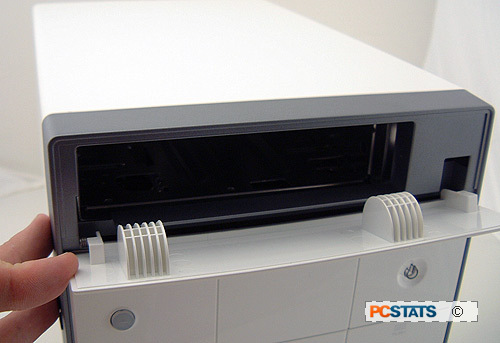 The MSI mPC 945 has a large vent on the side of the chassis for incoming cool air. 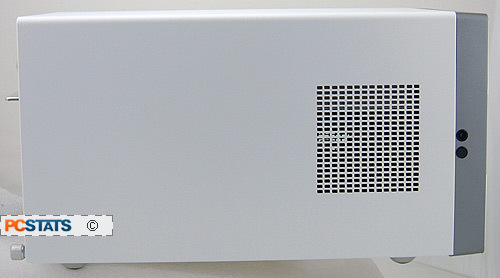 The single piece aluminum casing is coated with a nice white glossy paint job. The back of the system is where all the action really is, and we'll start from the bottom left. There you will find the various audio ports from Line In to Line Out, Microphone, Rear, Side and Digital channel jacks. Next are the two PS/2 ports for mice and keyboard. To the right of that is a Serial port and onboard analog output jack, we would have liked to see a TV output option as well for HTPC uses but this is not something the Intel 945G supports, unfortunately. 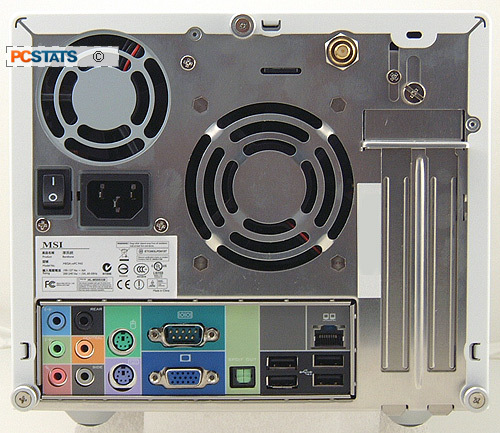 A full picture of the rear of the MSI Mega mPC 945 system. Here we see the 60mm power supply fan, 80mm case fan, two expansion slots, and the connector for the 802.11b/g Wireless antenna. At the bottom of the front bezel are the front panel I/O connectors. There is a SPDIF output jack and four USB and the Ethernet jack round out the ports. At the far right are the expansion slot covers, note you can remove the covers without a screwdriver. Near the top of the case is a gold plated connector for the wireless 802.11b/g antenna. Just below this near the center of the case is an 80mm exhaust fan and vent. It's a brushless Delta fan (model AFB0812SH) which is temperature controlled. It runs very quiet during normal operations, and spins up as temperatures rise. The chassis exhaust fan is detachable and replaceable should it ever fail. At left is the 260W Hipro Active PFC power supply.